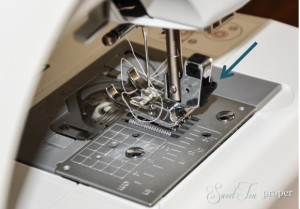 When thinking about what to post on next, I realized that it had been awhile since we updated our sewing guide with anything new. With the priority being to complete the tasks and projects on our home renovation, there just wasn’t a lot of time to invest in this hobby. Now that things have slowed down a bit, the sewing bug has bitten me again. 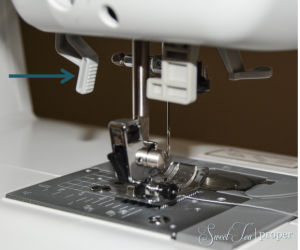 With a few more basics to share, our beginner’s sewing guide will help you to better understand your machine and keep your projects looking handmade, not homemade. 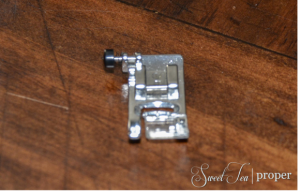 When you first start sewing, you can probably complete most beginner projects using the all-purpose presser foot that comes standard with newer sewing machines. You will find that this foot is ideal for most of your straight and zigzag stitching. This saves time by eliminating the need for changing out the foot when you change your stitch. However, at some point, you will find that your needs have expanded and that do-it-all presser foot just isn’t doing the trick anymore. Thankfully, on the newer sewing machines changing out the different presser feet couldn’t be easier. Most machines (when purchased new) come with several feet besides the all-purpose presser foot. If you read through the manual while learning the parts of your machine, you probably figured that out. However, if you are like me and jumped straight into sewing without scanning the manual, you probably didn’t notice all of the cool included extras in the flatbed attachment with accessory compartment. With that said, don’t buy any new feet until you find out which ones were included (oops…). There are many different kinds of presser feet, each one unique in its purpose. Unless you are a very versatile sewer, you probably do not need every type of foot. 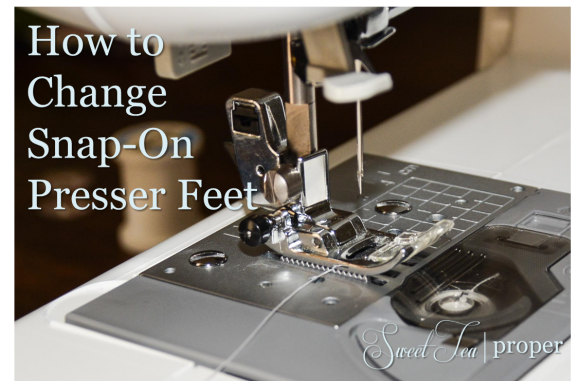 The best thing you can do before purchasing any new sewing feet is determine the kind of sewing you are going to do most frequently (apparel, home decor, etc), check which feet came with your machine, and then research which techniques you will be using that could be performed in an easier manner with a different foot. For instance, since our baby arrived, my primary sewing projects have been sewing baby clothes. After a few lessons, my sewing instructor, informed me that a rolled hem foot would be useful for future projects. Unfortunately, this did not come standard with my machine. Another handy foot for baby, toddler, and children’s clothing is a ruffler foot. Although it takes a little bit of practice to get the hang of it, the ruffler foot is a major time saver that easily ruffles, gathers, and pleats fabric. Generally speaking, each foot costs around $10 – $25 at your local fabric store. This can get quite expensive if you need several. Luckily, these stores frequently offer sales and coupons so unless you need it immediately, you can almost always get one for less. 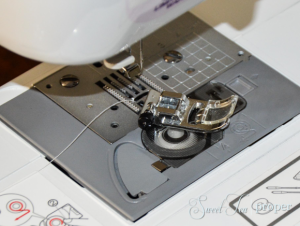 For this tutorial, we will be using a Brother SQ9050 sewing machine. Although the concepts are similar for most machines, please refer to your user guide for machine specific questions. I believe the Brother SQ9050 has been discontinued, but the model below is very similar in appearance and functions. *This is a referral link. If you purchase something through one of these links, this site will receive some form of compensation which helps us bring you more fun posts like this one! If it isn’t already, turn the handwheel counter-clockwise to lift the needle to the highest position. Behind your presser foot attachment, locate the small black button on the back of the presser foot holder. Press the button. Upon pressing the button, the attached presser foot should drop. Easy, right? One thing to notice with the snap-on presser feet is this small bar at the top of each foot. You want to make sure this is lined up perfectly with the presser foot holder or it will not attach. Once it’s lined up underneath the presser foot holder, lower the holder down. If it’s lined up correctly, the presser foot holder will pick up the presser foot. It is now attached and ready for use. If it doesn’t attach immediately, the presser foot holder and the bar on the presser foot are most likely not lined up. Lift the presser foot holder slightly and move the foot around until the presser foot holder picks up the top bar on the foot. Once attached, make sure your bobbin and machine are threaded and you are ready to sew! 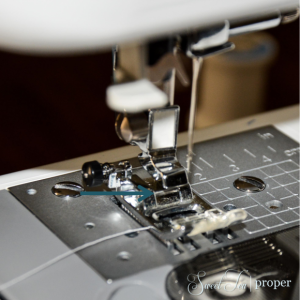 For more sewing tutorials, please visit our Sewing Basics page!